Like many dog training schools, AutumnGold includes an orientation night each session. Owners attend without dogs to learn about our training philosophy and methods. Because it is not unusual for young dogs to react with a bit of anxiety on the first night of class, we teach students how to reduce their dogs’ stress and provide methods for helping dogs to feel secure and safe during class. I typically answer this question with a parable about……. Like most rational adult humans, I am petrified of clowns – everything about them, really – their red bulbous noses, that crazy orange hair, their ridiculous cartoon-sized shoes. It’s creepy – All of it. For argument’s sake, let’s say he is hanging tough and comforting me. Would Mike’s comfort cause my clown fear to increase? Of course not (nothing can make me more fearful of clowns). Conversely, it is more reasonable to assume that having someone talk to me calmly, explaining to me that clowns are not dangerous (yeah, right) will reduce my anxiety. Can we reinforce fear? There is absolutely no evidence, nada, suggesting that providing comfort and security to a distressed dog causes the dog’s anxiety or fear to increase. Why then, does this myth persist among dog owners and even with some trainers? Why are owners still advised to ignore their dog when he is distressed or anxious or fearful because to provide any attention to the dog will reinforce those emotions? I suspect that it has to do with confusion about the difference between an emotional response (which is under very little conscious control) and a learned (operant) response (which is under varying degrees of conscious control). Lessons from Learning Theory: Learning theory clears up this confusion for us. When a person or dog experiences stress or anxiety or fear, these are emotional responses. We do not choose to be anxious or fearful; we actually have very little control over these responses. Conversely, any behaviors that someone uses to successfully escape or avoid fear-inducing situations are operant (we have some control over these). If these behaviors are successful in that they lead to a reduction in anxiety and fear, they will indeed be reinforced. This is called avoidance learning and happens when fleeing (the operant component) a fear-producing experience results in a reduction of fear (the emotion). Clown avoidance: For example, if I ran away from the clown at my door, I would experience relief from my fear. (Assuming of course that the clown was not chasing me on his tiny little bike). Because this strategy was successful in reducing fear and keeping me safe, I would, in all likelihood, repeat this tactic if I once again found a clown at the door. In this example, we say that “the behavior of running away from clowns has been negatively reinforced”. Stranger danger: Dogs, of course, also learn this way. For example, a dog who is nervous around unfamiliar people may hide behind the couch whenever someone new enters her home. The behavior of hiding is negatively reinforced each time that the dog uses it as a strategy because hiding allows the dog to avoid exposure to new people and results in an abatement of her fear. Unfortunately, this becomes a double-edged sword – if the dog preemptively hides each time that she hears someone at the door, she never has the opportunity to learn that visitors are not actually harmful (more about this later). Avoidance learning is NOT the same as “reinforcing fear” It is important to remember that anxiety and stress and fear are basic emotional responses that are involuntary and have important biological functions. Our dogs do not choose to be anxious or fearful. These are reactions to situations that a dog perceives to be unfamiliar or threatening. It is false to state that a dog chooses or willingly decides to experience fear. However, this is exactly what is implied when owners are advised to ignore their dog when he is anxious or fearful due to the erroneous belief that comforting will reinforce fear. Just ain’t so. Should we comfort our dogs when they are nervous? Okay, if we accept that providing comfort and care to a distressed dog does not reinforce fear, do we know whether or not providing comfort in the form of petting and speaking softly to our dogs helps to reduce their anxiety? Although it certainly feels like it should, do we have evidence that supports or refutes this? Although still limited in scope, there is a growing body of research that addresses this question. For example, last year, a group of researchers in France reported that dogs who were examined in a veterinary setting with their owner present and comforting them demonstrated reduced signs of stress when compared with dogs who were examined with the owner seated away from them (see Science Dog essay “Be There“). The Study: The study included a group of 10 dogs and their owners. Each dog was tested in two conditions, while visiting a training center that was unfamiliar to the dog and owner. In the “petting” condition, the owner gently petted their dog for a period of one minute, while talking to a friendly stranger. In the “no petting” scenario, the owner talked to the stranger without petting their dog. The dog’s leash was then handed to the stranger and the owner left the area and remained out of sight for three minutes. The researchers video recorded each test and measured the dogs’ heart rates, salivary cortisol levels and behaviors before, during and after separation. Heart rate: When dogs were not petted by the owners prior to separation, their heart rates did not change. Conversely, when they were petted prior to separation, heart rates decreased (difference approached statistical significance; P = 0.07). This result suggests that petting either prevented or reduced the stress response associated with separation of the dog from the owner. Calm behaviors: The petting scenario resulted in significantly longer periods of calm behaviors exhibited by the dogs while they were separated from their owner, compared to the no petting scenario (38 seconds versus 11 seconds of calm behavior, respectively). Overall, not highly stressed: In general, the dogs in both conditions displayed mild behavioral signs of stress, some vocalizations, and oriented towards the area that the owner exited. However, these signs were not severe and salivary cortisol levels after separation were not elevated, suggesting that the level of stress induced by this test was relatively low. Conclusions: The results of this pilot study suggest that, when dogs are subjected to a mildly stressful situation such as a short separation from their owner, gentle petting prior to the separation can promote reduced feelings of stress and calmer behaviors. While this is not earth-shattering stuff, it is a nice bit of evidence showing that providing comfort and a secure base to our dogs is a good thing and not something to be discouraged. The moral of the story? If we do not believe that comforting a loved one when they are distressed is the wrong thing to do (i.e. we should comfort those who we love), why would we consider this to be an appropriate approach with our dogs? Fear/anxiety is not a choice. The caring (and effective) approach to dealing with a dog’s anxious response is to calmly and quietly come to the dog’s aid and remove him from the anxiety-provoking situation. In our training classes, we quickly move dogs who appear stressed to a quiet corner or behind a set of visual barriers. We teach owners how to body block so that they act as their dog’s safe base. We encourage owners to sit on the floor and allow their dog to lie close or in their lap (size permitting) as the dog gradually acclimates to the new setting and commotion of class. In some cases, we may partition off a small section of the training floor with gates. We find that this often allows timid dogs to be introduced to the class once they are comfortable and happy. It is the responsibility of each of us, as our dogs’ caretakers, to protect them from excessively stressful and frightening situations. Simply ignoring a dog’s stress in a misguided attempt to change behavior is counter-intuitive to most owners who love their dogs – as it should be. Not only does comfort not reinforce fear, we have evidence that our dogs benefit from our comfort and support by showing reductions in stress and anxiety. Be there for your dog, always. And, remember. Clown fear is real. Stay away from them. Cited Study: Mariti C, Carlone B, Protti M, Diverio S, Gazzano A. Effects of petting before a brief separation from the owner on dog behavior and physiology: A pilot study. Journal of Veterinary Behavior 2018; 27:41-46. 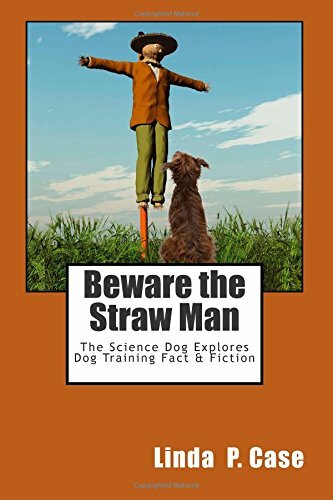 Interested in more dog training and behavior myth-busting? 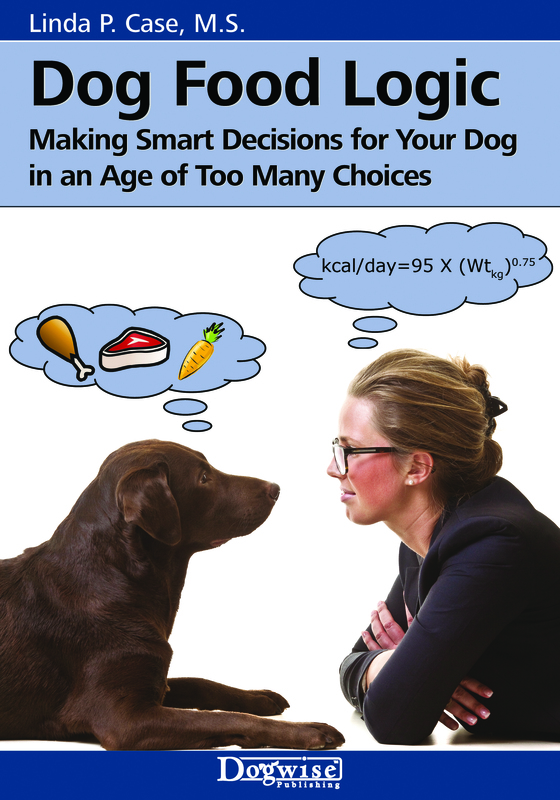 See Linda Case’s newest book – “Dog Smart: Evidence-based Training with The Science Dog“! Iâve been reading your books for over 10-years after someone I respect told me you were one of the experts to follow in the USA. Thank you put writing such informative and well-reasoned books and blog post. I just recently became aware of your website while reading more on nutrition. You can download it for free using this discount code, âMATHâ. Or I would be happy to email you a copy if you wish. Using the “Guaranteed Analysis” and the “Calorie Content” on the pet food label the cheat sheet will do the math so we can compare any type of food. Or if available from the website or manufacturer I use the proximate analysis for a more accurate representation. Since we consumers are not provided digestibility and other helpful information Iâm just working with whatâs available. It will also calculate kcal/kg if company only provides kcal/oz. Or kcal per can of food. I totally agree with you in this subject. I think people and trainers might give those suggestions in order to prevent something else from happening. There is a common belief that if we pay attention to the fireworks the dog will start paying attention to them as well and starts connecting the sound with owners reaction. And some people can be so afraid that their dog will become afraid that they sort of make it happen by accident (it’s not necessary my opinion but something I’ve heard quite often). The other thing, I suppose, is that many people don’t recognise fear or anxiety in their dogs. They comfort when there’s no need or ignore when the dog is screaming for help. With my dog I’m trying to be supportive, not making a big deal when something startles Hugo but if he needs to be close to me – I’m there and if he needs to hide under the bed I’ll leave him alone. Now, especially on walks when we hear a shot or a sudden firework-like sound he often stop and looks at me. And depending on his needs we either ignore and continue, do some easy tricks to change the subject or have some food tossed in the grass. It really varies. It’s a great subjects because it raises so many questions and as usually you also give answers. Thanks for that! p.s. I absolutely love the clown analogy! We’re discussing this article over on my breed group website, and one of the points is the thought of alternative approaches to addressing the fear. In fact they believe the comforting is still not a good idea. Thanks for this helpful info. Great comparison with the clown analogy! Fascinating post. I’m with you…clowns ARE creepy and weird. No if’s, and’s or but’s about it. Why are you so afraid of clowns?